Weve all experienced times when we have not eaten a balanced diet or weve eaten too many sweets. We feel sick, light-headed, and occasionally depressed, or we become irritated and edgy. Its the bodys way of letting us know that its lacking sufficient nourishment. Optimal health requires optimal nutrition. The same is true spiritually speaking. Without sufficient and regular biblical nutrition, our inner life begins to suffer the consequences. We become shallow and selfish, more demanding, and less gentle, and we are quick to react impatiently, rashly, and angrily. These are telltale signs of inner malnutrition. 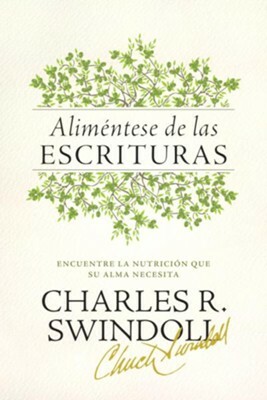 In Aliméntese de las Escrituras [Searching the Scriptures], respected Bible teacher Chuck Swindoll shows us how to dig deep into Scripture and uncover its profound truths for our lives. He outlines the principles of Bible study that will help you understand Gods Word, apply it, and communicate it clearly to those around you. Too many people try to go it alone, without a guide for this life and the next. Chuck explains how we can fix our own spiritual meals, then invites us to feast on nourishing truths we can discover in Gods Word. I'm the author/artist and I want to review Alimentese de las Escrituras: Encuentre el sustento que su alma necesita - eBook.